Poppyprint: Quilt Labels - a Guest Post! Quilt Labels - a Guest Post! The lovely Becky of Chasing Cottons invited me to participate in her incredible Quilt Class 101 series. Have you been following? Even experienced quilters will learn new things, and if you are a non-quilter who is chomping at the bit to get started, I highly recommend you check out the series. Every step of the quilting process is covered by Becky and other fabulous guest bloggers over the past few months on the Wednesday posts. While you're there, have a look at the the Chasing Cottons downloadable pattern selection. Becky is a talented young designer with great ideas for your modern, or traditional fabrics. 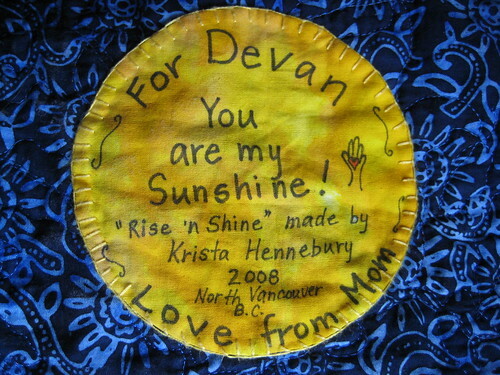 I especially love her wildly original Curlicue Crush quilt. It's another creative way to use Drunkard's Path blocks! I think I'm officially converted and will make the Drunkard's Path die my next Accuquilt purchase. You can read my guest post on labeling your quilts there today! At the bottom of the post, there is a link up for people to share their own labeling methods, or a favourite label, too. Lots of wonderful inspiration!! You've still got until tomorrow to enter Birthday Month Giveaway #3 here. The odds are lookin' good! Friday is my big day. It's what I'm referring to as my double-lucky birthday...I'll be 44 on the 22nd. Holy cow. I'm going to tell you the story of my 22nd birthday on the 22nd. Now, THAT was a birthday!! I'll also announce the big kahuna, ultimate Birthday Month Giveaway #4. You don't want to miss that one!! Thanks for the tip Krista will check out Becky's blog ASAP! In the meantime I think I need to see the front of the quilt that this tres cute label is attached to. Hmmm....should also know what your favourite type of cake is for Saturday's celebrations!! Can't wait for the big Kahuna! Sounds awesome! I will check out your post over there too. No doubt some sort of brilliance is shared which should not be missed eh? My comment on Chasing Cottons says it all! My 40th was quite memorable. Can't wait to hear your story! In case I won't be able to stop by tomorrow. - happy birthday my young friend! !